Article from Reason by Nick Gillespie and Alexis Garcia. 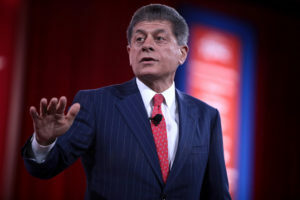 No legal commentator on cable news is more energetic, constitutionally minded, or libertarian than Andrew Napolitano, who has served as Fox News’ senior judicial analyst for nearly two decades. A former New Jersey Superior Court judge, Napolitano is a nationally syndicated columnist—you can read him at Reason—and the author of a shelf full of books about law, history, and race in America. Reason caught up with the judge at FreedomFest, the annual event held every July in Las Vegas. We talked about Donald Trump’s ongoing makeover of the federal judiciary, whether Supreme Court nominee Brett Kavanaugh will be good for libertarians, what it’s like to be an ex-Republican, and the imminent return of Freedom Watch, the popular and controversial show that Napolitano hosted on Fox Business from 2006 to 2010. I think he talks too much and most of it is his own opinion. I, for one, have stopped listening to him. I agree, I think I’ve heard enough! he is like a flag in the breeze-says one thing one time & next time spouts something else.